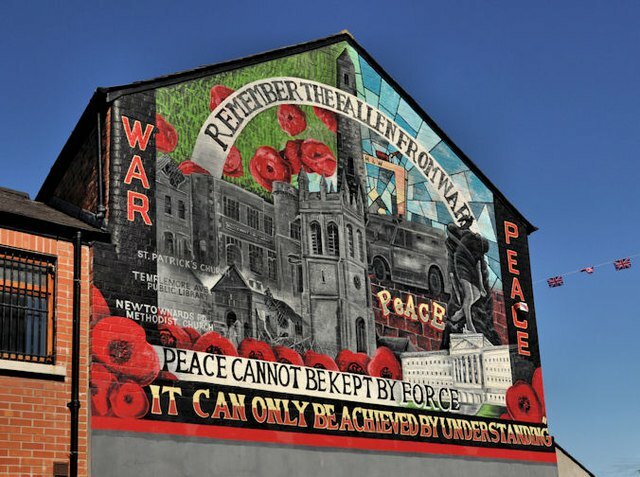 War and Peace mural, Ballymacarrett, Belfast. Credit: © Albert Bridge - geograph.org.uk/p/2986909. CC-BY-SA/2.0. The Northern Ireland peace process was once held up as a model to the world, but given the current impasse in the region’s politics and the cultural conflicts that replaced the violence this model has inevitably been tarnished. In reality, the popular, male-centric version of the model was never a true representation of a process that involved other groups, especially women. On the anniversary of the Good Friday agreement it’s time to acknowledge the contributions of these groups and consider the alternative visions and aspirations they put forward for a new and better society. A recent series of witness seminars that I initiated in Belfast brought together Catholic sisters, Presbyterian, Methodist and Church of Ireland women in conversation, and recorded their experiences of the ‘Troubles.’ Their collective remembering revealed that women of faith were ahead of their time in terms of developing approaches to repairing the harms that were caused by the conflict for individuals and their communities. Moreover, they were party to innovative examples of ecumenical activism and community living that defied and transcended sectarianism, including integrated education. Equally important, though previously unknown to the general public, such women were participants in the secret back-channel talks between politicians from Northern Ireland, mainland Britain, the Republic of Ireland, the US and different groupings of combatants that were critical in bringing about a cessation of the violence. At least in the initial stages of the dialogue, they appear to have been the only women involved. It’s important to recognise that women of faith secured a place in these talks not because men thought they should be there, but because they thought they should be there. That their participation has remained undisclosed and undocumented for so long has significant implications. It provides telling insights into the peace process, the narratives that undergird it, the ways in which it was implemented, and the extent to which the history of the Troubles in all its dimensions is still a male preserve. Feminist scholars have worked hard to redress this neglect, but the activism of women of faith in Northern Ireland remained virtually unexplored prior to the witness seminar project. Moreover, a general lack of attention was encouraged by one-dimensional characterizations of such women in the media which disregarded their historical commitment to contemporary values like reconciliation, communal repair, the need for bridge-building across the sectarian divide, and the articulation of meaningful forms of peace. The erasure of women of faith from the historical record can partially be attributed to assumptions that they form another element of a backward-looking, conservative past that needs to be challenged in the present in order to build a progressive and forward-looking Northern Ireland. In fact, the evidence of their activism during the conflict suggests that they, along with other marginalised groups, could help to revitalise a process that is presently paralysed and visionless. Women of faith worked with and through myriad groups and organisations, linking their own activism to a range of ideas, concepts and ethical ideologies supportive of peacebuilding work. This combination had both practical application and emotional appeal in being able to move the human imagination beyond simply the cessation of violence. One example was “Cornerstone,” “a live-in Community, a praying Community of reconciliation involved in the local area and networking with other groups…Being a ‘Presence’ was the most important thing in a divided community—to show that Catholics and Protestants could actually live together and cook and do the shopping and just be a community” as one of the seminar participants put it. The tendency to ignore these stories disregards the rich and complex histories of women of faith that stretch back centuries. Those histories are replete with narratives of struggle against violence, injustice, poverty and oppression. They include resistance to male control and endeavours to fulfil gospel imperatives to help—indeed love—the most marginalized in society. Not all religious women lived lives of service and sacrifice, but enough did to make a difference, including in Northern Ireland. Nevertheless, in the public imagination such women are still identified with the preservation of normative gender roles and the conservative narratives that underpin them. But the witness seminars revealed that during the conflict, some women contested patriarchal restrictions and value systems through a variety of means, from the known—like grassroots community activism—to the unknown, including their participation in secret talks. Their activism was a factor in creating the climate on the ground and the depth of communications between the warring parties that facilitated the peace process. At times this required confronting powerful groups within and outside of the Church, transgressing normative gender roles, challenging traditional gender stereotypes, and demonstrating that feminism's reach extended to encompass religious women. With religious values as core to their activism, women of faith negotiated their roles within the church, and at times, they also negotiated their own ethno-religious identities. They were closely monitored within their own communities and by the security and paramilitary forces. Their experiences and recollections illustrate the effects of male hierarchies, violence, social deprivation and religious and community norms on different groups of women. These women belonged to churches with long histories of silencing them. Their conditioned tendencies toward self-effacement, getting on with the job at hand, and doing what needed to be done with no thought of self-promotion or posterity further facilitated their erasure. This silencing was compounded by the long-entrenched male tradition in Northern Ireland of marginalising women. Above all, the context of the conflict demanded silence because of the suspicion and mistrust that permeated communities, a fear of the ‘other’ and also of your own side, and the danger that reaching out could designate you as part of the ‘enemy within.’ Yet reaching out was precisely what women of faith did best. The research to date indicates that their interventions were critical in breaking the deadlock when the peace talks descended into familiar patterns of each side blaming the other and the process going nowhere. Women were acutely conscious of how ‘going nowhere’ meant more suffering and more grief for people who were already worn down and beleaguered. They were unafraid of expressing what this meant in uncompromising, human terms that left no doubt about the irreparable damage done to communities, the lives destroyed, and the horror and hurt felt by everybody. The seminar conversations about the secret talks revealed that women of faith brought an element of raw emotion into the room that helped to facilitate a break-through, whereby the meetings shifted from attributing blame to sharing pain. This became a common feature that helped each side to understand the other, and to reinforce what all sides already knew—that for the sake of everyone the conflict had to stop. This is as true of the future as the past. For the sake of all, the voices of women of faith and other marginalised groups must be heard in any discussions about the future of Northern Ireland. It is time to break the silence.